In a bowl take about 3 cups of yogurt & beat it well add 2-3 tbsps besan (gram flour) & mix well, then add haldi, lal mirchi pdr, dhania masala pdr Mix well & add 2-3 cups of water. And keep aside. Now Heat a pan, add some cooking oil & add in methi seeds, a pinch of asofetida (hing), 2-3 dry red whole chillies & fry till they all start spluttering, then add sliced onions (2 medium sized) & fry 2 mins, then add some ginger garlic paste (or chopped) cook 2 mins, then add some haldi, lal mirchi pdr, salt to taste, dhania pdr & garam masala , cook the masala for a min. Ddd some peas, chopped spinach (I use frozen peas & spinach. Go easy on the spinach not too much) & some chopped potatoes. Cook a few mins then add the Yogurt, besan & water mixture & increase the flame to full, keep mixing the kadhi & bring it to a boil. After the first boil let it cook on med-low flame at least 20-25 mins. Keep mixing it in between & if u feel it is too thick you may add more water. Now ur kadhi is ready. Just before u serve it, heat 2 tsps of ghee add a lttle red chilli pdr & add the tadka to the kadhi, garnish w/dhania & ENJOY the kadhi w/boiled rice. Thank You Everyone, will post more recipes soon. 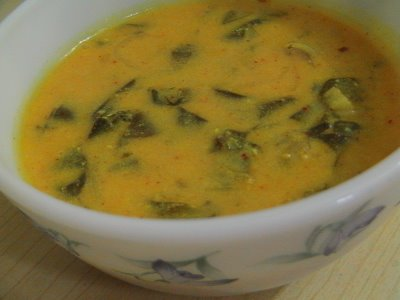 Hi Gurveen, Thanks for sharing such a nice and easy recipe of punjabi kadhi. I like this recipe because of using vegetables. I would recommended this recipe as restaurant style delicious kadhi. My family & me die for this kadhi. We like punjabi food so pls. post more easy & healthy recipes. was yummilicious! V al loved it.....thanx fr sharing! Definitely it will taste yummy,Planning to cook today evening itself.